Women’s Equality Day on August 26 and the upcoming release of Suffragette on October 23 by wearing the colors of suffrage – purple for dignity and ability, green for hope, and white for purity – this Wednesday. I am also excite to share with you the release of a new movie Suffragette with Academy Award nominees Carey Mulligan and Helena Bonham Carter, and three-time Academy Award winner Meryl Streep, lead the cast of a powerful drama about the women who were willing to lose everything in their fight for equality in early-20th-century Britain. The stirring story centers on Maud (played by Carey Mulligan), a working wife and mother whose life is forever changed when she is secretly recruited to join the U.K.’s growing Suffragette movement. 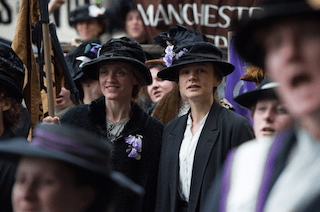 Galvanized by the outlaw fugitive Emmeline Pankhurst (Meryl Streep), Maud becomes an activist for the cause alongside women from all walks of life. When increasingly aggressive police action forces Maud and her dedicated fellow Suffragettes underground, they engage in a dangerous game of cat-and-mouse with the authorities, who are shocked as the women’s civil disobedience escalates and sparks debate across the nation. Inspired by true events, “Suffragette” is a moving drama exploring the passion and heartbreak of those who risked all they had for women’s right to vote – their jobs, their homes, their children, and even their lives. The film also stars Ben Whishaw, Anne-Marie Duff, Brendan Gleeson, Romola Garai, and Natalie Press. “Suffragette” is directed by BAFTA Award winner Sarah Gavron from an original screenplay by Abi Morgan.